Last Updated: March 6, 2019 | Subscribe to our weekly newsletter! You’ve opened your pool, and you’re looking forward to long, lazy afternoons relaxing in the crystal clear water. Or maybe you’re planning a big pool party for friends and family. But is your pool ready? How do you know? The answer is pool water testing. You probably already know how to test for basics like chlorine levels and pH balance. But what about phosphates? Or salt levels, if you have a salt water pool? Then there are potential contaminants like copper, iron, and calcium. If you’re leaving those out, you could be leaving your pool vulnerable to potential damage, not to mention an unsightly appearance. Gear up and get ready for some in-depth (pun fully intended) testing tips. If you don’t test your pool water, how do you know what the chemical levels are? Or what undesirable substances are in it? Or how much and what chemicals to put into the water to create a clean and safe swimming environment? The answer is, you don’t. You absolutely must learn how to test pool water, and then do so on a regular basis. In fact, out of all the pool maintenance tasks you’ll perform over the life of your pool, testing the water is the one thing you’ll do more than anything else. Make sure you know how to do it properly, and always keep testing supplies on hand. How hard can it be, right? There’s just one key to making sure your pool water testing is accurate: the water sample. The most important factors here are where you take the sample from, and how you do it. If possible, take the sample from the absolute middle of your pool. Use a clean cup or bottle (with a cap if you’re taking it to the pool store). Hold it upside down so the opening is facing the pool floor. Insert the cup into the water elbow-deep, and then turn it right side up to collect the sample. Important: Do not take the sample near the skimmer opening or any return jets. 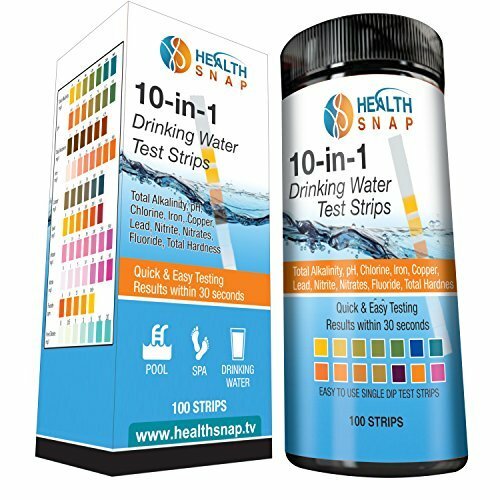 In addition to being super quick and easy to use, test strips can also sometimes be more accurate than liquid test kits because human error can make it difficult to match up the colors using the chemical drops. Test strips are also usually less expensive than liquid kits, but you’ll go through them more quickly, so it just about balances out. Dip a strip into the water, quickly in and out. No need to let it stay submerged or soak. Hold it still in the air for about 15 seconds. No shaking! Compare the strip to the guide on the packaging, and match up the colors on both. The type of strips you’ll use most often are general ones that check for the primary components of ideal pool water: pH, alkalinity, and chlorine. But you’ll also find specialty strips that test for things like copper, iron If you click this link and make a purchase, we earn a commission at no additional cost to you. and salt If you click this link and make a purchase, we earn a commission at no additional cost to you. .
For regular maintenance testing, you really only need a basic liquid test kit If you click this link and make a purchase, we earn a commission at no additional cost to you. . Just make sure it includes phenol red and orthotolidine (OTO) to test pH and chlorine, respectively. Collect a water sample in the collector provided in the test kit. On the side designated for pH testing, add the recommended number of drops of phenol red to the water. On the side designated for chlorine testing, add the recommended number of drops of OTO to the water. Hold the collector up to a white background, and compare the colors of the water to the color scales on the collector. The redder the water, the higher the pH, and the yellower the water, the higher the chlorine level. Important: If the levels are low, the water colors will be fainter, and can be difficult to see. For higher accuracy, be sure to hold the collector up to a white background. Just a sheet of printer paper will do. 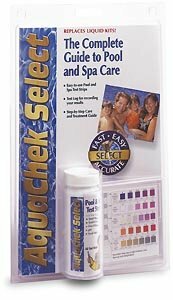 If you decide to take a sample of pool water to your local pool store for testing, collect the sample the same way you would if you were testing at home. You may be able to have water tested on a walk-in basis, but it never hurts to call ahead to make sure they’ll be able to accommodate you. To ensure the pH and alkalinity remain balanced, and to keep your sanitizer at optimal levels, test your pool water at least once a week. You’ll want to test it more often if the pool is getting a lot of use or if it’s rained, and every time you add chemicals. Even if you do the pool water testing yourself, take a sample to a pool store once a month for a pro check, and when opening and closing your pool. You may also need to test more often if you have problems with your pool water, many of which can crop up due to the quality of the water you put in your pool. Well water contains more minerals, so you may see more copper and iron in your pool water. And if your city has hard water, the likelihood of high calcium levels is increased. These contaminants can make it more difficult to maintain the proper chemical balance in your pool, and they can stain and otherwise damage pool surfaces. Keeping an eye on them and preventing damage is more efficient and less costly than having to fix that damage later. And that prevention starts with pool water testing. If your pool water is cloudy, or you have greenish or black stains on your liner, copper is a prime suspect. Copper buildup usually happens for one of two main reasons. First, the tap water you use to fill your pool may contain trace amounts of copper. As water evaporates from your pool, it leaves the copper behind. The less water in the pool, the higher the copper levels. To counter evaporation, you’ll add more water, which means you add more copper, and then more water evaporates, and that leaves—you guessed it—more copper in your pool. Second, low pH levels can cause copper elements in your pool filter or plumbing to corrode. The corrosion will then make its way into your pool water. The longer the corrosion is left unaddressed, the more copper buildup you’ll have in your water. 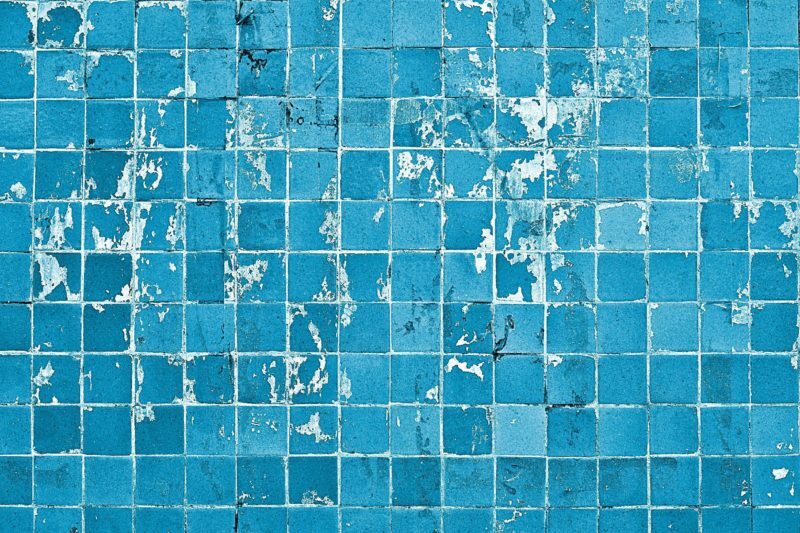 Greenish stains on the pool walls and floors may be an indication of too much copper in your pool water. Most test strips don’t test for heavy metals. You’ll need a special set If you click this link and make a purchase, we earn a commission at no additional cost to you. in addition to the ones you use for, chlorine, pH, and other levels. The good thing is, they’re pretty inexpensive. While it’s ideal to conduct pool water testing for chlorine and pH levels weekly, it’s sufficient to test for copper once a month. Testing your water on a regular basis will keep copper levels at bay before you even see its effects. This will mean less work for you as you won’t have to remove liner stains on top of addressing the copper in your water. In addition, because low pH levels can contribute to high copper levels, it’s essential to test them weekly. Keep them under control, and you may be able to avoid copper buildup altogether. After testing your pool water, if you do find it contains a high level of copper, you have a couple of options to remedy it. This is a substance that forms chelate complexes with polyvalent metal ions, especially copper, iron and nickel, to prevent oxidation. In plain English? A metal sequestrant If you click this link and make a purchase, we earn a commission at no additional cost to you. binds with certain metals in your pool water and keeps them from rusting, which is the cause of those greenish or black stains on your liner. It’s usually a liquid you add to your pool water. Be aware that a sequestrant does not remove copper from your water—it simply keeps the copper from staining your liner. Also note that sequestrant breaks down over time. If high copper levels are due to the element being present in your tap water, you’ll need to add sequestrant on a regular basis to prevent stains. It’s best to follow the instructions on whatever sequestrant you choose. You may also want to find out what chemicals and minerals are present in the water where you live. This is exactly what its name sounds like. Much the way your regular filter removes debris and other undesirable substances from your pool, a metal trap filter grabs hold of metal in your pool water, thereby removing it. A metal trap filter selectively filters out metal, so it’s not meant to replace your regular filter. It’s also not a permanent piece of equipment. You’ll set up and use the filter to remove the metal from your water, and once the process is complete, your pool water should be free of metals. Note that metal trap filters are sized by the number of gallons they need to filter, so be sure to choose one that can accommodate the volume of your pool. If you use tap or well water to fill your pool, using a hose filter If you click this link and make a purchase, we earn a commission at no additional cost to you. can keep at least some of the copper out of your pool in the first place. You walk out, all ready to dive into your pool and cool off—and find the water is brown or rust-colored. Gross! No one wants to jump into that. Sounds like you may have too much iron in your pool water. Just like copper, iron levels can rise if your pool water’s pH balance is low, so there’s another good reason to make sure you’re testing pH balance on a weekly basis. Also, if you get your water from a well, it may have higher iron levels than tap water which, in turn, will mean high iron levels in your pool. And as happens with copper, as your pool water evaporates, the iron is left behind only to increase each time you add water to your pool. If you’re unsure of the minerals present in your well water, you can test it, or have it tested by a certified water testing lab in your state. Usually, the same strips or kit that test for copper will also test for iron If you click this link and make a purchase, we earn a commission at no additional cost to you. . It just makes sense as both are metal elements. The only difference will be that once you’ve filled the test tube with a sample of your pool water, you’ll add a special solution made to test for iron. Then compare the water color to the color coded chart included with the kit. Obviously, if your pool water has turned brown or rusty, you’ll want to test it for iron levels. But conducting pool water testing for iron once a month—at the same time you test for copper—will help you monitor levels on an ongoing basis, and keep the water clear and beautiful. It’s all about prevention. Again, because they’re both metal elements, the same remedies to fix high copper levels will also work for high iron levels. You can use a metal sequestrant If you click this link and make a purchase, we earn a commission at no additional cost to you. 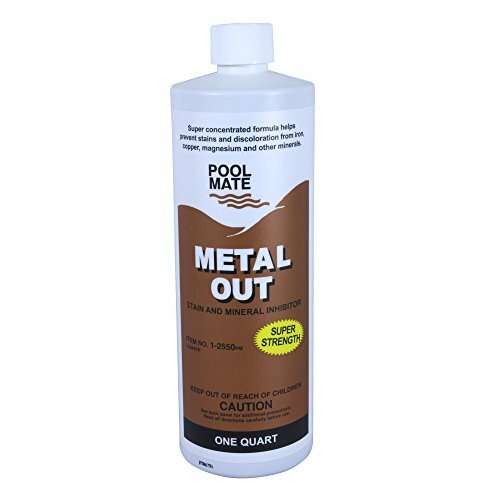 , which won’t remove the iron, but will keep it from rusting and staining your pool. Just remember sequestrant will dissipate, so adding it must become part of your regular pool maintenance. Also, controlling pH levels can help control iron levels, so keep a good handle on those. 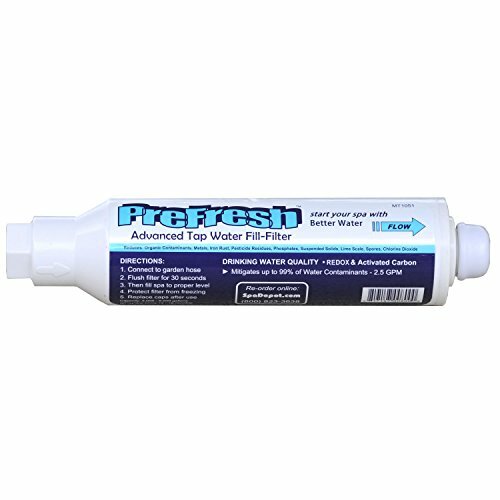 Finally, a metal trap filter or a hose filter If you click this link and make a purchase, we earn a commission at no additional cost to you. works just as well for iron as it does for copper. So if your water has turned a yucky brown color due to high iron levels, don’t worry. It’s fixable. Whether water is hard or soft is determined by the levels of calcium and magnesium in it. Depending on where you live, you may have to deal with the problems created by hard water. If you get calcium buildup in your faucets and showerheads, imagine what it’s doing to your pool filter and pump. Not only that, too much calcium in your pool can cause cloudy water, rough pool surfaces, and heater inefficiency. But unlike copper and iron, it’s also possible for calcium levels to be too low. 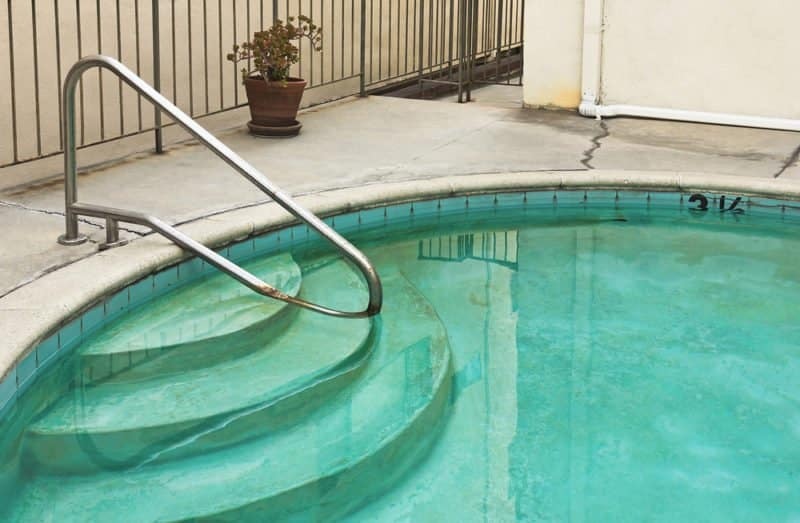 With that comes a host of other problems including pitted concrete pool surfaces (including your pool deck), dissolved concrete and grout, and etched plaster. Over time, these can become expensive problems to fix. 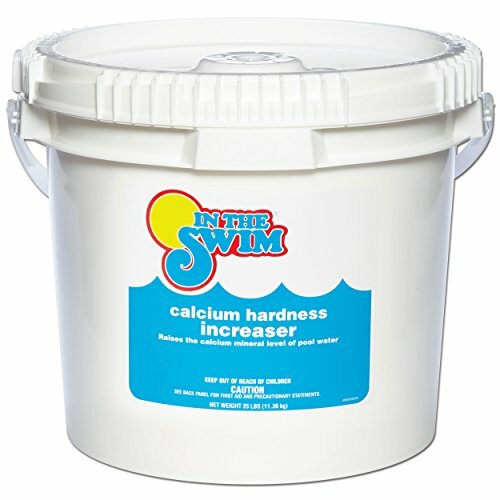 Keeping calcium levels balanced is essential to prevent damage to your pool and its surroundings, and to save you money. A calcium imbalance can cause deposits, dissolved grout, and other expensive damage. The total hardness (the measurement of both calcium and magnesium salts) level in your pool should be somewhere between 200 and 500 parts per million (ppm). 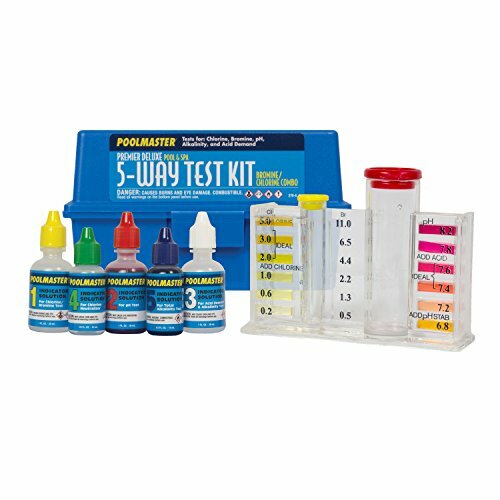 A professional-grade water testing kit If you click this link and make a purchase, we earn a commission at no additional cost to you. is going to be your best friend. 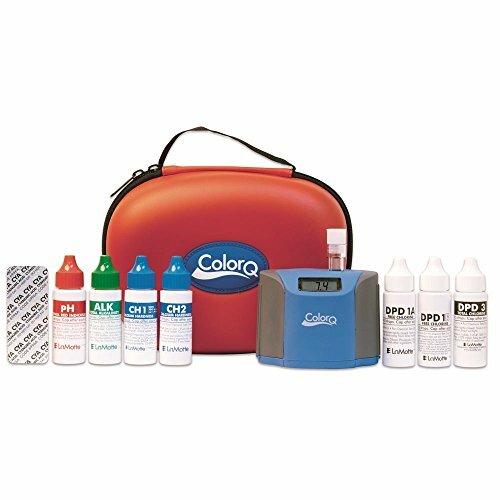 The best pro pool water testing kits will test for calcium levels along with chlorine, pH, copper, iron, and other substances. 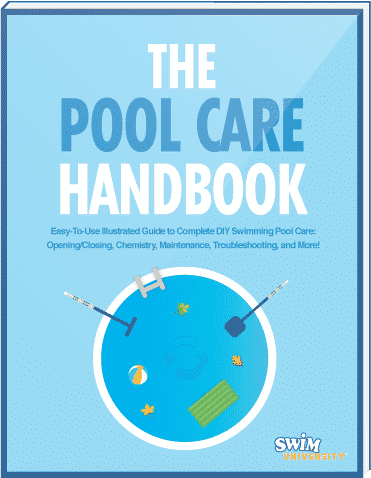 You’ll simply add a chemical indicator to a small sample of pool water and compare the water color to the included color-coded chart to determine whether your pool water’s calcium is too high or too low. If your pool water becomes cloudy, or you start to see scaling on your pool liner, or you notice any pitting in the concrete in or around your pool, it’s definitely time to test for calcium. At that point, though, you’re a little late to the party. To stay on top of things, prevent damage, and save yourself from having to make expensive pool repairs, test calcium levels at least once a month. However, if you live in an area where the tap water is either hard or soft, or you get your water from a well that has a high level of calcium, you may want to test more often, maybe every two weeks, or even once a week just to be on the safe side. You have three options here. If your water source isn’t hard, and your pool’s calcium level has risen due to other factors, you can drain a few inches of water from your pool, and replace it with softer water. When added to your pool water, a flocculant will attract the excess calcium If you click this link and make a purchase, we earn a commission at no additional cost to you. and cause it to clump, making it easier to remove. 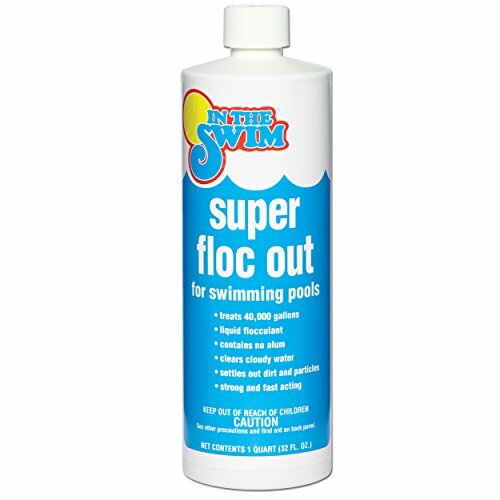 Once the flocculant has worked its magic, clean your pool’s floors and walls to remove the calcium. Then backwash your pump filter, and clean it. 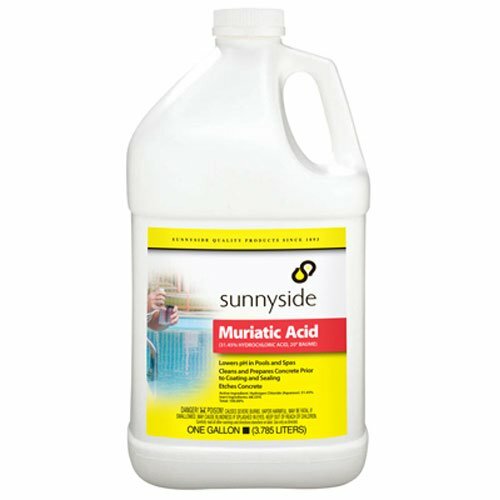 If the first first two options don’t work, you can try adding dry acid or muriatic acid If you click this link and make a purchase, we earn a commission at no additional cost to you. to your pool water. This will not reduce the water’s hardness. Instead, it raises the saturation level, which will help to balance the water. This is a much easier task than lowering the amount of calcium in your pool water. If calcium levels are too low, simply add calcium chloride, also called calcium hardness increaser If you click this link and make a purchase, we earn a commission at no additional cost to you. , to your pool. How much you add will depend on the size and volume of your pool, so follow the manufacturer’s instructions carefully. Testing for Phosphates: Do You Really Need To? Harmless and so ubiquitous they can be found in everything from pharmaceuticals to cleaning products to fire extinguishers, phosphates are essential to our everyday life. The truth is, phosphates are not a problem for your pool water. 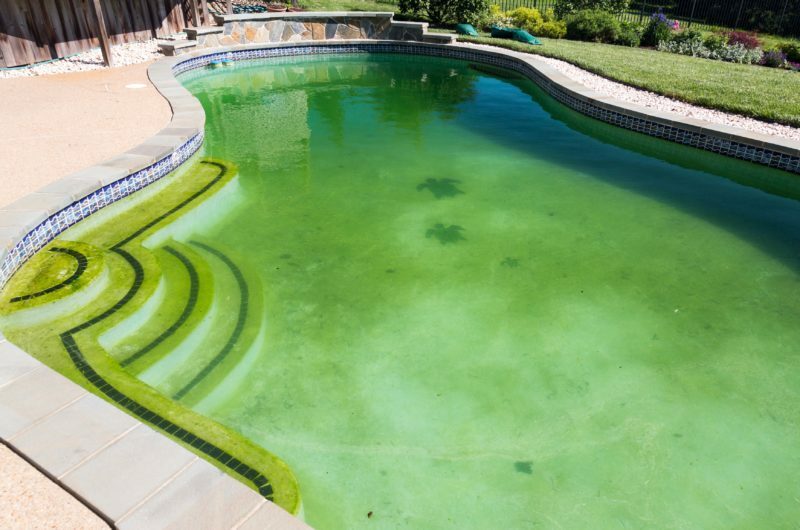 You may hear that phosphates are a problem because they serve as a food source for algae, which can have a tremendously negative effect on your pool. But killing its food source is not an effective method of controlling algae. Once it’s established itself, algae can be very tough to get rid of. You really don’t need to. Your pool will always contain phosphates, no matter what you do. That’s normal. They find their way into your pool via dirt, twigs, and leaves that fall into the water, sprinkler runoff, or even fresh water used to top off your water levels to counter evaporation. Addressing this issue—and more importantly, the problems it can lead to—actually isn’t a matter of reducing phosphates. The key to controlling algae is prevention, usually in the form of algaecide If you click this link and make a purchase, we earn a commission at no additional cost to you. . If you also have problems with copper in your water, be sure to choose a copper-free algaecide If you click this link and make a purchase, we earn a commission at no additional cost to you. .
You’ll also want to make sure your chlorine levels are stable, and that your pH and alkalinity levels are correct. Keeping those three things balanced will go a long way to preventing algae from taking over your pool and turning it into a black lagoon. It’s also important to note that adjusting your phosphate levels will not get rid of algae once it’s formed. Once you have algae in your pool, you must take steps to kill and remove it. Again, it’s about addressing the algae directly, not the phosphates. If you were lucky enough to find a home with an existing salt water pool, or you’re thinking about converting your pool to salt water, you’ll need to add testing for salt levels to your regular pool maintenance schedule. Just like calcium, salt levels can be a problem whether they’re too high or too low. Too much salt can throw your salt water chlorinator into overdrive. Too little salt is even more important to address because it has an effect on how clean your pool is. Your pool’s salt water chlorinator requires salt to produce chlorine and keep your pool clean and sanitary. If there’s not enough salt in the water, you won’t have enough chlorine, and this can present problems not only for your pool, but for those swimming in it. Balanced salt levels are essential to chlorine production to keep your salt water pool clean. To keep your chlorinator running well, and your chlorine at optimal levels, you want to shoot for a salt level of approximately 3,200 ppm. Once again, specialty test strips If you click this link and make a purchase, we earn a commission at no additional cost to you. are the fast and easy method to determine pool water salt levels. Using them is a simple matter of collecting a water sample in a test tube, dunking a dry test strip into the tube, removing it, and waiting about 20 seconds for the results. 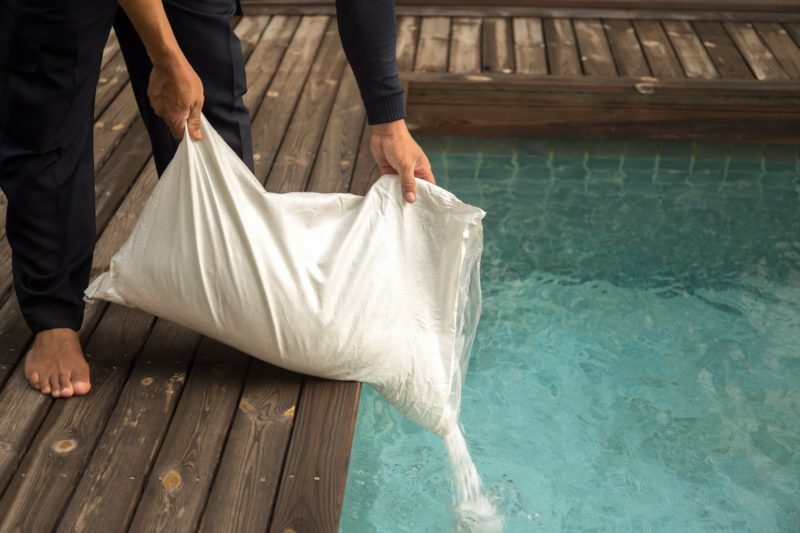 Because it’s not as delicate to keep balanced as other chemicals and substances in your pool, salt can be tested just once a month. However, you may want to test salt levels after certain events such as a rainstorm, adding fresh water to your pool, or after you’ve had a lot of guests swimming and splashing around in the pool. 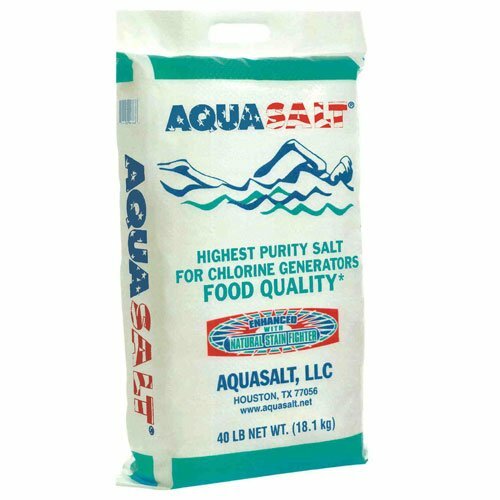 To prevent your chlorinator from having to work too hard to assimilate an overabundance of salt, it’s a good idea to reduce too-high salt levels. You can easily accomplish this by draining a few inches of water from your pool, and adding fresh water to bring the level back up. Retest, and continue the process until salt levels are back in the optimal range. If you test your pool water and find that salt levels are too low, you’re in luck. This is quite possibly the easiest problem to fix with a salt water pool. All you need to do is … add more salt If you click this link and make a purchase, we earn a commission at no additional cost to you. ! Add a little salt, wait a few hours for it to dissipate, then retest your pool water. If salt levels are back to normal, you’re done. If they’re still too low, repeat the process until you get the result you need. Welcome to 21st century pool care! With apps and digital devices, pool water testing is easier than ever. Several smartphone apps for pools exist, and can help you manage your pool care from anywhere. Some of them may require that you purchase special test strips that can be scanned by the app, so take that into account before downloading. This is like a super-powered liquid test kit. You still add liquid chemicals to water samples, but instead of having to eyeball color scales, the digital reader does the hard work If you click this link and make a purchase, we earn a commission at no additional cost to you. for you. Digital test kits also check for just about everything, including free chlorine, total chlorine, bromine, pH, alkalinity, calcium hardness, and cyanuric acid. It’s a pool water testing powerhouse in the palm of your hand. Are You Ready to Take Your Pool Water Testing up a Notch? If all you’ve been testing for is chlorine and pH, it’s time to broaden your testing range. All of these additional substances are simple to test for, even if you’re a novice pool owner. 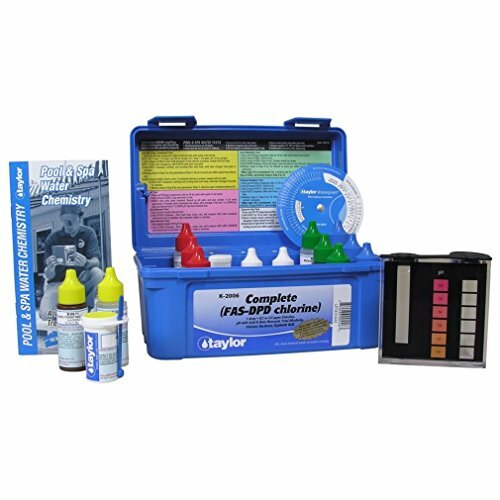 With instant test strips, easy-to-use liquid test kits, and a little discipline in your maintenance schedule, you can take control of your pool water testing, prevent a lot of problems and expense, and keep your pool beautiful and swimmable all season long. Finding a pool store you can trust is paramount to make sure you can get what you need, not spend more than you have to, and fully enjoy pool ownership.